Newly reconfigured for Amsterdam’s Stedelijk Museum, HIGHER xtn. is an adaptation of Michele Rizzo’s 2015 performance HIGHER, which explores how nightclubs offer dancers a space for self-expression and communion. 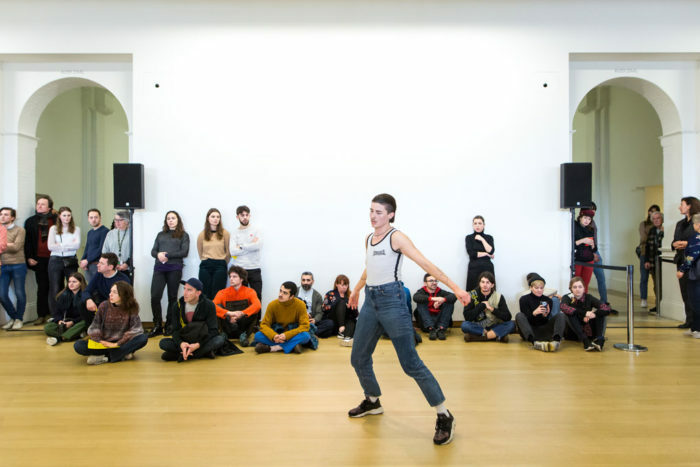 Drawing from the work of theorists Julia Kristeva, Boris Groys, and Mihaly Csikszentmihalyi, Rizzo considers how dance can facilitate states of flow, totality, and transcendence, and acknowledges the connection between dance and para-religious practices. He is particularly interested in the cathartic and transformative power of techno music, whose repetitive rhythms can temporarily blur the perceived boundaries of the body. HIGHER xtn. is also attentive to the important role that nightclubs play as gathering spaces for marginalized groups, and to how clubs fosters public intimacy while providing individuals an environment in which to explore their identities. In HIGHER xtn., dancers negotiate the boundaries between the self and the collective. 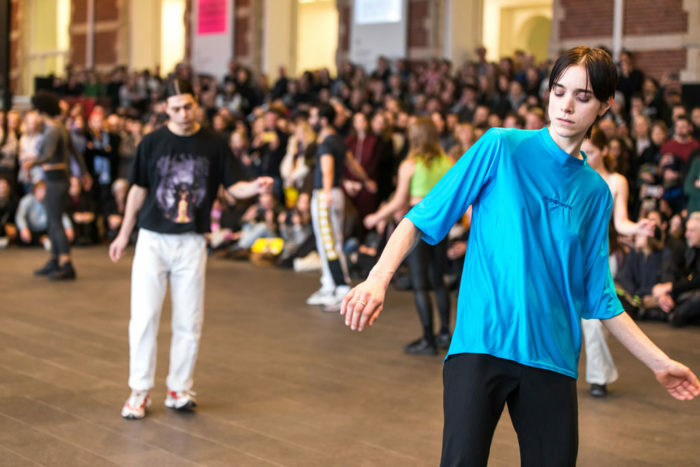 While performing minimal, repetitive movements, individual dancers make their way through the galleries, ultimately convening in the Stedelijk’s Audizaal—and eventually had to move to the museum’s entrance hall, because of the high attendance. Then, pairs of dancers begin to perform in sync until the entire group is eventually dancing in unison. As the repetition of the choreography reconfigures the group into a single body, Lorenzo Senni’s hypnotic electronic soundtrack intensifies in tandem with the dancers’ movements. 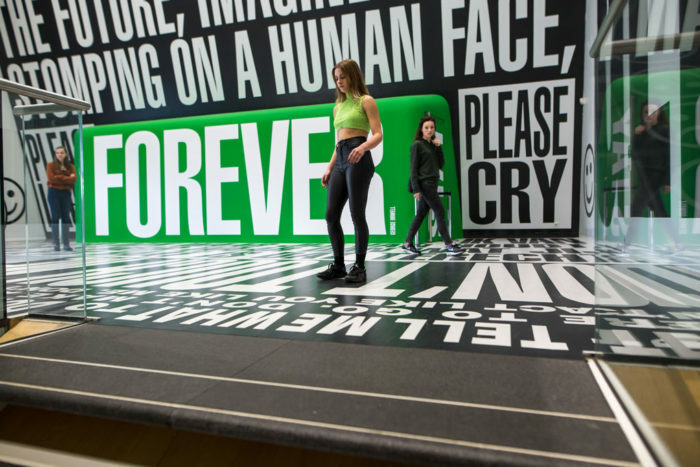 During its run at the Stedelijk Museum, HIGHER xtn. 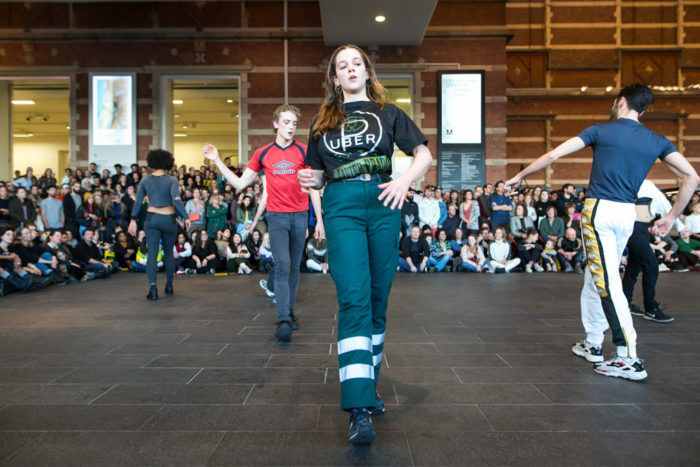 added more dancers with each performance, beginning with two and ending with fourteen, including students from the School for New Dance Development of Amsterdam (SNDO). Giulia Crispiani was there to see the last run of a series of eight. Among others, Michele Rizzo will be in Bologna for the Live Arts Week VIII, curated by Xing, presenting Spacewalk, the second part of the trilogy begun with HIGHER, and Prospect <E V A> with Billy Bultheel. The third part Deposition will be presented at Triennale Milano at the end of April. Another version of HIGHER xtn. (redux#5) will be performed at Fondazione Sandretto Re Rebaudengo in mid April. Giulia Crispiani: I came to see the last run of your performance. The entrance hall of the Stedelijk was packed with people. Before that, I could follow its unfolding mainly on Instagram—as it was thoroughly shared—and every week I could see it growing both in complexity and numbers. So, I was wondering what did it mean to you to take club culture to the museum, after it went through other performance contexts, and most of all to receive such an overwhelming attendance? Michele Rizzo: When I answered the Stedelijk museum’s call for “Freedom of Movement” I simply thought it would be a chance to share the work with a different audience. I took the opportunity to “invade” another space with the work, both as a challenge and as an exciting experience. I have always connected HIGHER to some sort of infective agency. This work was developed in the first place in a moment I was truly in love with clubbing, and incredibly excited by an experience that revealed itself to me as mysterious and inspiring, and in my case, being a dancer, it manifested particularly in the activity of dancing to techno. I was driven by this enthusiasm when I decided to bring what I was learning in the club at first into the studio, trying to distillate my experience into some sort of conceptual and aesthetic material. It wasn’t easy, and first attempts felt rather disappointing. But eventually some understanding came after I realized that obviously it wasn’t about artificially recreating the same experience, but rather to bring it into dialog with the new environment of the studio. HIGHER is mostly a conversation between different ways of thinking about dance and performing. Dance as an art form (as I have approached it in my studies) and dance as social and meditative activity (what I have experienced it in the nightclub). This dialectic relationship unfolded in many ways, and transformed in a very exciting practice which at first produced two different formats: the original HIGHER show for the theatre, and the HIGHER workshop, in which I shared in a more relational way most of the related research material. When I started to think of the work adaptation from the black-box to the museum space, I saw an opportunity in inviting another voice into this conversation. In the theatre version, which features three dancers only (myself included), the performance devotedly respects the architecture of the space, being hyper-frontal and offering itself to the audience as an object to be looked at. The museum structure required this frontality to be broken down to at least four sides, creating new interstitial spaces between the dancers. I have found the experience of the club so rich, because it is both extremely intimate/personal and extremely social/communal at the same time; so the fact of being observed while entraining a very self-contained and self-focused dance is a very important aspect of HIGHER. Certainly, to have a 360 degrees source of attention greatly enhanced our experience as performers. Similarly, I had to rethink the existence of the work in time. The original work has a duration of 45 min and starts with a light show that intends to slow down the heartbeat of the audience, preparing it to receive the very repetitive and hypnotic dance material. In the museum the performance starts immediately with the musical pattern made by Lorenzo Senni, playing from speakers in the main space. All the dancers depart from the furthest galleries of the museum, and slowly make their way towards the music source, performing a very introspected groove. In each performance few more performers join the group, which increases from two up to fourteen. But beside any adaptation procedure, I learned the most along the way. Initially, I did not considered for example that Instagram could become such a huge and consistent sharing media for the work, at least not to such an extent. In this sense I found fascinating how phone/cameras-use-policies in the three spaces of the club, the theatre and the museum are so different between each other. From being strictly forbidden in the club, in order to ensure people’s safety and freedom, to being mostly un-tolerated in theatres, and finally to become an augmented source of attention in the museum, and seemingly manifesting as a gesture of enthusiasm. I think I posted the first Instagram story of HIGHER xtn. out of my own enthusiasm on the first day of the performance, because I was frightened but certainly excited. To answer your question in a more general sense… it is a bit much for me to say that I brought club culture to the museum. I only brought my work to the museum. Club culture still happens at night, away from cameras, and away from deliberately designed choreographic patterns. But certainly club culture is important for many people, it becomes part of many people’s life, as it became for mine. I present HIGHER to any kind of audience with this spirit. I had the slight feeling of being sober in a club, which I often have when I watch people dancing on techno music—and I can’t take part in it. Obviously this is a beautiful choreographed piece. Yet, beyond your reflection around the club as a safe and religious space, considering the several shifts happening from the black box to the white cube, from strobe lights to daily light, from safe space where nobody’s watching to a stage where you are on show, have you thought also of what does mean to “entertain people with entertainment”—if that even makes sense, to re-stage this experience within a more critical art context? Is the club mere entertainment? I don’t think so. I think the word entertainment is too reductive. For me entertainment is any TV show that I watch when I don’t wanna think about anything. My experience of the club has never been entertaining in that way. On the contrary it has been a source of self-reflection, of identity reconsideration and re-formation; a way to observe the way I relate to other people, how I perform and how others do. And in all these regards it hasn’t been always just a pleasant experience either. I think that to refer to clubbing as mere entertainment would mean to reduce it to a stereotype, in which we would see people just “losing themselves” or practicing “escapism,” instead of noticing how that space prompts self discovery within an immersive social and sensorial experience. On the same note, I do not aim to entertain people with my work, ever. What I hope to do is to share with them an experience. In this case an experience of enthusiasm, that for us, as dancers, it emerges slowly by devoting ourselves stubbornly to a strict movement unison that ultimately is there to liberate us. In this sense I also don’t relate to the idea of “re-staging.” Obviously I’m not re-staging a party, nor a club: HIGHER is purely a derivative form of my experience of the club, not a universal representation of clubbing as a phenomenon. Speaking of entertainment, there were kids sitting aside of us, and they managed to keep their attention for the entire duration of the piece, which to me it’s impressive. If you could wish for an effect this piece would have on them, what would that be? I wish to inspire them to dance all their life. Throughout almost five years of this project’s existence I have had the opportunity to share my research in a form of a workshop with very different kinds of audiences, sometimes with amateurs too. As much as the concept of amateur gets completely relativized when it comes to club dancing, I have found people who initially struggled to simply move their body to the beat. Once they would be gently guided to that basic practice they could just appreciate it. I have heard people saying that they danced with us while watching us dance. I think that’s the best when it comes to watching dance in general, you stop watching with your eyes only and you start watching with your whole body. Indeed, my thought drifted away several times, as I was hypnotized by music and movements. I thought about bodies choreographed to dance at unison but eventually always dancing alone. There are moments you looked at each other, but never touched. I thought of contagion of course, especially considering the evolution of the project through time, going from two dancers to fourteen, with the audience growing exponentially with the number of dancers—and I wondered, I saw somehow a mirroring in the status of contemporary representative politics—or maybe I wanted to see it. Can you maybe expand on the social implications of the piece? When I was imagining how to expand HIGHER to the context of the museum in a more durational form, and I considered the possibility of working with a large group of dancers, as the work appeared to have the potential to become stronger and stronger in intensity. The theme and title of the exhibition was Freedom of Movement, which refers to the possibility of people to move between countries VISA Free, a possibility that is currently at stake due to the rise of populist and nationalist parties in several parts of the world. In this sense, when I looked at HIGHER xtn. in my imagination, I saw a constant growing group of fierce dancers, expressing their desire to be united and free to move by means of their dance. However, I didn’t make this work in order to deliberately share a political message. I think that by being a language ultimately customized on the individual who is expressing it, dance is political by default, and should be guaranteed to anyone. You move between Amsterdam and Rome, have you ever brought the piece there? Do you feel Higher being beyond geography or like a piece that might change and adapt according to the local scene? Do you usually travel with your dancers? Actually, I moved away from Rome in 2007, and stayed in Amsterdam ever since. But I do love Rome, and I love to come back to Italy to show my work. I have performed the theatre version of HIGHER in Italy several times, in Turin, Santarcangelo, Milan, Rome and my hometown Lecce. I always travel with the same dancers Juan Pablo Camara and Max Goran. After the performances of the xtn. version at Stedelijk some institutions in Europe asked if I would be interested in working with local dancers, but as much as it would be great to do so, it’s also not easy. The material of the performance is quite complex and requires considerable time and resources to be properly developed, and that’s simply not always possible. At the same time that possibility feels super exciting. I hope that one day it will happen. “Locality” and its displacement is an interesting aspect of this work anyways. 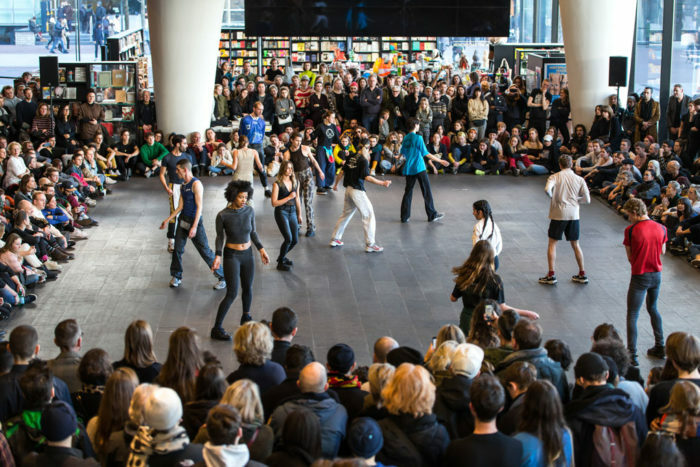 Most of the dance material is based on movements that I learnt in the clubs of Amsterdam around seven years ago, when you could still spot some ravers who danced Dutch shuffle (konijnendans), a derivative of the so called Melbourne shuffle, which in turn emerged in Australia decades earlier from dance moves associated with Hardstyle music, which again originated in Holland. In this sense dance styles (with regard of dance-music culture) travel around the world through different generations of party people, transform and develop constantly. I remember going to dance in Berlin some years ago and someone telling me I “danced like Amsterdam.” I think that’s great and still makes me smile, because I nearly never felt as Dutch as that time. When did the music happen? Was is before or after the choreography? How did you work with Lorenzo Senni? I asked Lorenzo Senni to make original music for the theatre version of the performance HIGHER back in 2015. We worked in the studio during the second phase of the work, so after the purely experimental phase. I had already developed the basic material of the piece and was looking for a sound that would support the trance inducing movement score, without proposing a too didactic reference to club or techno. Lorenzo’s music, in its entirety, appeared to be perfectly matching my desire, being it so abstract and dry and yet so viscerally evocative. For HIGHER xtn. we use the same musical composition of the original performance HIGHER. I know you’re going to show your work Spacewalker at the Live Arts Week, what is the work about? What else are you working on at the moment? Yes, I’m very excited to bring this work to Italy for the first time. Spacewalk is the second episode of the trilogy initiated with HIGHER, that continues with Deposition, my last work. While working on HIGHER, I started to be acquainted with the idea that while dancing we connect to an experience of space that is augmented. In that space our identities as dancers (kinesthetic identity) shift and morph constantly. I used to define that space as the space of trance, in which the potentiality of my body appeared to have its own very vivid quality. What I try to do in Spacewalk is to render that space through theatrical and aesthetical means. The language that I am referring to in this work departs entirely from the club environment, then embraces a more digital and dystopian imagery. After Spacewalk I conceived Deposition, which concludes in a circular motion the travel initiated with HIGHER, and from the virtual space of Spacewalk brings me back to my own body, through a series of perceptual practices. Michele Rizzo (b. 1984, Italy) is a choreographer and visual artist whose work explores processes of transformation and transcendence. 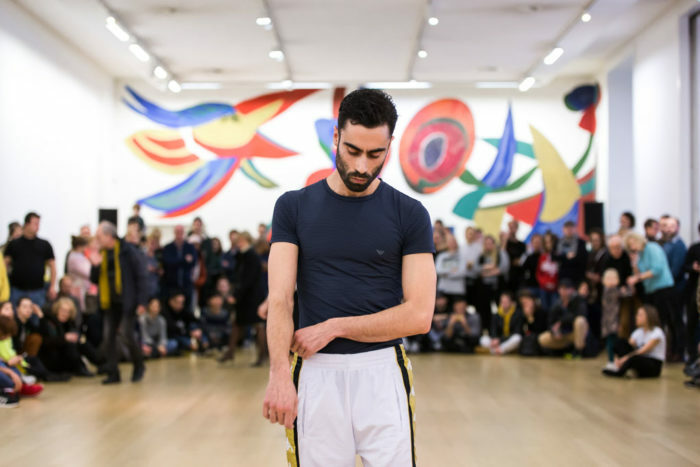 Trained in visual arts as well as dance, Rizzo studied at the Sandberg Instituut in Amsterdam and at the School for New Dance Development in Amsterdam, where he often teaches choreography and movement research. Giulia Crispiani is a visual artist and writer based in Rome, where she is an editor for NERO Editions.